Saturn's polar regions are home to brilliant auroras created by the collisions of charged particles above its magnetic fields, just like on Earth. And now you can see Saturn's southern lights in all their infrared glory. 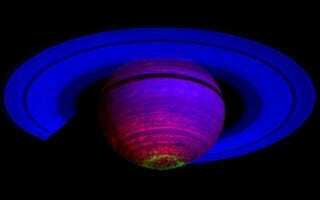 The basic mechanisms of the auroras on Earth and on Saturn are roughly the same. On both planets, ionized particles from the solar wind collide with atmospheric particles, which are then funneled through the magnetic fields near the poles. This releases energy and leads to the emission of a photon, which together creates the array of brilliant colors one can see around the Arctic and Antarctic Circles. Now, Saturn doesn't work in quite the same way - the auroras there are also affected by various internal magnetic processes that make it impossible to see the auroras in visible light. However, Saturn's auroras look quite brilliant in infrared, ultraviolet, and radio wavelengths, and now the Cassini spacecraft has snapped this amazing infrared photo of Saturn's southern lights. Since this photo is actually in infrared, the colors you can see are a bit of artistic licence. Basically, the green region is the aurora, the blue is reflected sunlight, and the red is thermal emissions from within Saturn. You can get a closer look at Saturn's aurora by clicking on the image up top, and there are even more high resolution images at the link. For more information on Saturn's auroras, check out our previous posts here and here.